Mar e Sol 33 is a privately owned house in Ponta do Ouro. 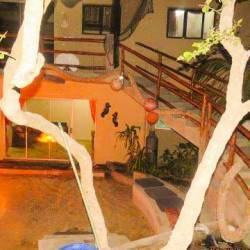 Situated in the upmarket Mar e Sol estate, this holiday home is situated in the 3rd row from the beach and can accommodate 14 people in 6 bedrooms. Mar e Sol 33 is a double storey house and comprises the upstairs section with 4 bedrooms (with 4 bathrooms) and the downstairs section which has 2 bedrooms and 2 bathrooms. The house can be rented as a 14 sleeper (both sections), or just the upstairs section can be rented (8 sleeper). The upstairs section with 4 bedrooms has 3 x queen size beds and two single beds in the 4th bedroom. The downstairs section with 2 bedrooms has 3 x single beds in bedroom 1 and a queen and single bed in bedroom 2. The open plan living area comprises a fully equipped kitchen, lounge, dining area which lead onto a spacious patio with beautiful seaviews and furnished with a gas braai and comfortable outdoor furniture. The house is serviced daily and there is a main walkway from the house that leads down the beach access gate. The water in the resort is borehole water and has proved safe to drink in the past, however it is recommended that the filtered water from the fridge fountain be used for drinking purposes or bottled water be purchased in the village. No smoking permitted inside the houses. Gas refills are available at reception.